Phillip W. Magness » What’s really behind “adjunctification” in U.S. higher ed? What’s really behind “adjunctification” in U.S. higher ed? In my last two posts I dissected some of the statistical trends of the U.S. higher ed job market, particularly as they pertain to the growth of part-time faculty over the past 40 years. As I noted the other day, most discussions about this topic are fraught with misconceptions and mythology, such as the claim that three fourths of all faculty are now adjuncts. I also seem to have underestimated the pervasive mathematical illiteracy that seems to plague a small but vocal community of adjunct “activists” (some might call them “madjuncts”) who strangely seized upon the fact that the most recent available in-depth study of adjunct employment by institution type is now 9 years old. They have yet to offer a reason why being 9 years old makes that study’s findings invalid, save to shout “Great Recession,” which has apparently become the 9/11 of the paranoid progressive left. What they don’t account for is that (1) the pattern the 2006 study illustrated – i.e. 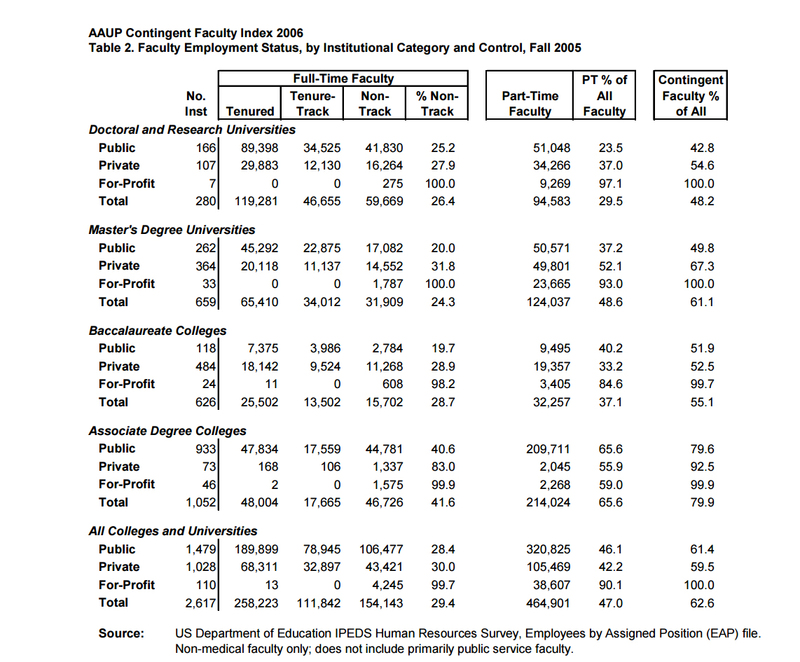 the extreme disproportionate dependence on adjuncts in for-profit higher ed – has not changed any since its publication, and (2) the overall percentage of adjunct employment has actually flattened out and remained virtually unchanged between 2006 and the present, according to multiple more recent studies that have tracked that number. Nevertheless, I wanted to take a closer look at the claimed “adjunctification” of U.S. higher ed. It is undeniable that both the percentage and total number of adjunct faculty have grown dramatically in the past ~40 years, but what this trend means and why it is happening are widely misunderstood if not outright misrepresented by the “activist” quarters. So let’s take a closer look at how a couple of the most common theories of adjunctification hold up. According to one common narrative, the adjunct boom is largely a product of the late 2000s recession and directly related fiscal constraints on the U.S. university system. The usual version of this story claims that the “Great Recession” induced higher ed budget cuts at the state and federal levels and a decline in tenured faculty retirements, which in turn dried up the available resources to hire new full time faculty. As a result, cost-conscious university administrators have allegedly turned en masse to inexpensive adjunct labor to fill teaching requirements at so-called “poverty level” wages (the wage claim is a myth in its own right). So how does this theory hold up? Not very well. Multiple recent studies have estimated the percentage of faculty positions held by adjuncts. While they differ slightly in methodology, they all show the same pattern: the percentage of adjunct faculty in U.S. higher education has remained completely flat for almost a decade. The 2006 study that I cited the other day placed adjuncts at about 47% of the U.S. university system, compared to about 53% who were full time. 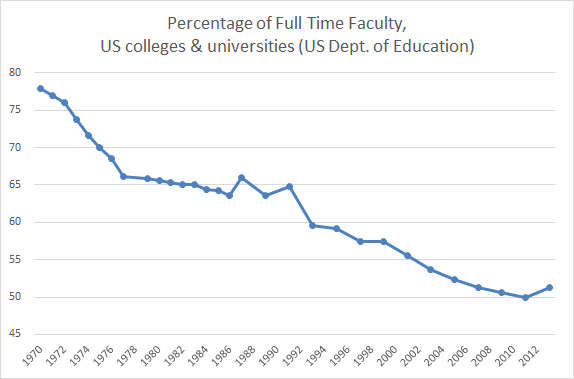 The following chart tracks the full time faculty percentages using U.S. Department of Education data and shows that the full time percentages stabilized in the low 50s around 2005, and have remained there ever since. 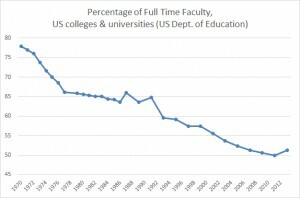 Interestingly enough, the current stable period follows some three decades in which the percentage of full time faculty declined, although the sharpest drop actually took place between 1970 and 1977 – the supposed glory years of U.S. academia that many of the adjunct activists pine for while lamenting the present. 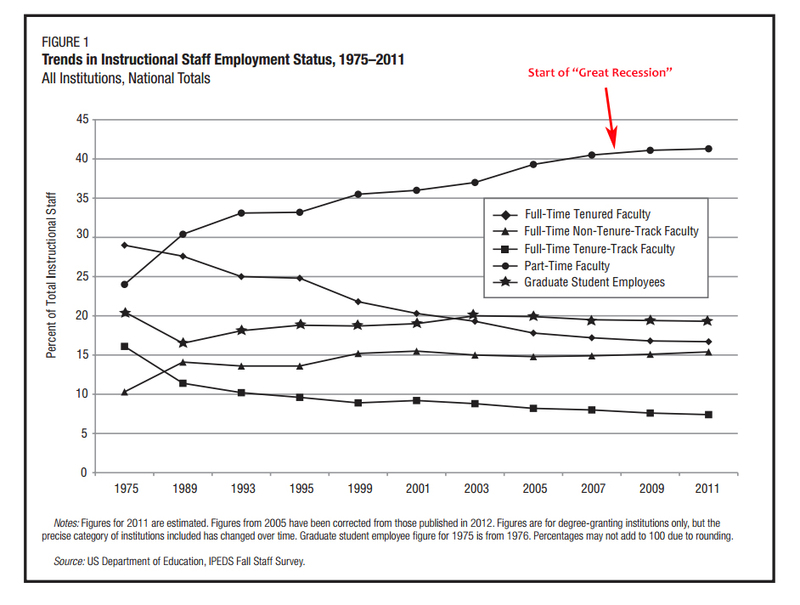 It would seem, then, that the “Great Recession” theory of adjunctification is without basis. A second common explanation for the growth of adjuncts is the notion that previous tenure and tenure-track positions are being phased out by universities, again to either save money or redirect it from teaching to administrator bloat (which is a different problem in itself), sports, campus facilities, or any number of other university budget lines. Proponents of this theory often lament a purported decline of new tenure and tenure-track positions since the 1970s – essentially arguing that tenure is being phased out in favor of less expensive alternatives with substantially less job security and lower wages. Echoing the recession theory, some versions go so far as to claim that the “phase out” consists of allowing tenured faculty to retire only to replace them with multiple adjuncts teaching only a couple of courses each. So how does the “phase out” theory pan out in the data? Very poorly. 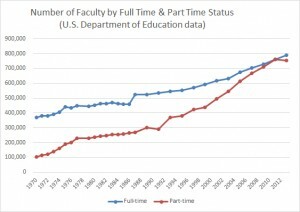 The total number of full time faculty has expanded dramatically in the last 40 years. It stood at only 369,000 in 1970 and has more than doubled to 791,000 today. It is true that in the same period, the number of adjunct faculty also grew dramatically and at a faster rate than full time positions. 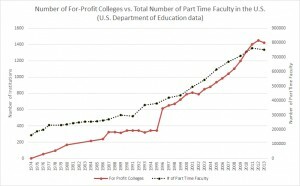 But both have numerically increased at a near-continuous pace and there is absolutely no evidence that full time positions are being “phased out” and replaced by less costly adjunct positions – that would require a decline in full time positions, an event that has not happened since 1985. 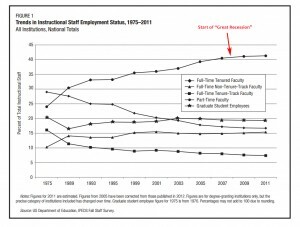 If (1) the “Great Recession” did not bring about an adjunct boom, and (2) full time faculty positions are not being “phased out” and replaced by adjuncts, the question still remains: why have adjunct numbers grown so dramatically since 1970? The answer may be found in the trend I pointed out the other day. The so-called adjunctification phenomenon is almost entirely a product of two sources: the rise of For-Profit Higher Ed and the growth of Community Colleges. 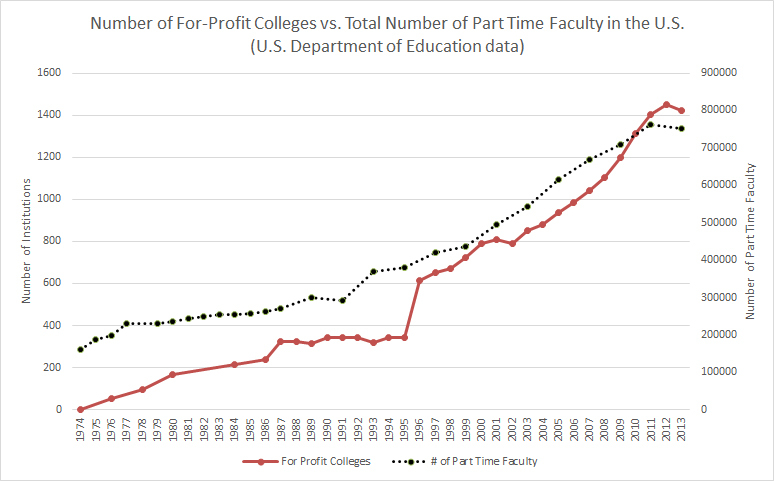 In fact, growth in part time faculty ranks is almost perfectly correlated to the growth in the number of For-Profit institutions (places like the University of Phoenix and Corinthian College, which offer expensive and typically student loan-financed degrees of dubious quality). 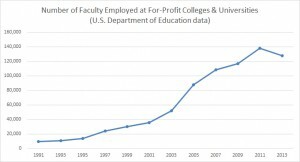 The U.S. Department of Education only provides raw numbers of faculty employed at for-profit institutions going back to 1991. This number has exploded though from just over 9,000 faculty in 1991 to a peak of almost 140,000 instructors in 2011. To understand what this means, recall from my post the other day that for-profit institutions are almost exclusively dependent on adjunct faculty. A disproportionately high 90.1% of faculty at for-profit institutions in the United States are adjuncts. 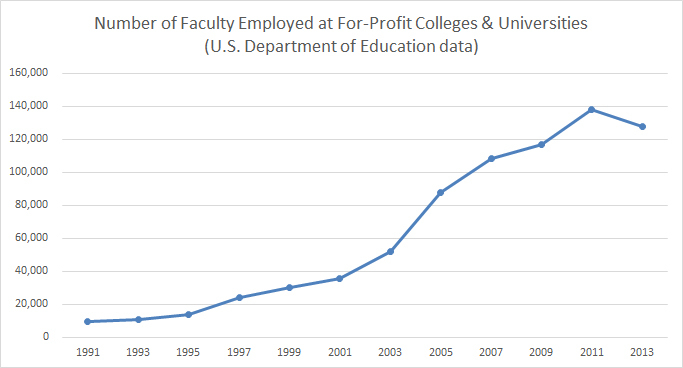 Those numbers indicate that of the roughly 130,000 positions that for-profit higher ed added since 1991, about 117,000 of them were adjuncts. That also suggests an astounding 25% of all adjunct growth since 1991 has come from one single source: for-profit higher ed. Note that this still leaves other areas of adjunct growth. The next biggest source after for-profits is likely community colleges, which also disproportionately rely on adjunct instructors though at a comparatively tame rate of about 65%. 2-year community colleges added about 174,000 faculty between 1991 and 2011. Using the 65% part time rate, we can calculate a rough estimate that indicates a little over 110,000 of those additions were adjuncts. Taken together, employment growth in these two subsections of the higher ed marketplace, for-profit institutions and 2-year community colleges, are almost certainly the main drivers of the so-called “adjunctification” phenomenon. Typical 4-year colleges and universities, or what most people traditionally think of when they hear the word “college,” have not experienced adjunct growth patterns that are anywhere remotely near these two specific subsets of academia. And that would seem to make economic sense. Like it or not, traditional 4-year colleges and universities tend to offer (1) a higher level product than community colleges and (2) a higher quality product than for-profit institutions. The price on that credential is also usually higher as well and, particularly with elite institutions and even large state research universities, there’s a clear premium on attracting and retaining higher level faculty and more permanent levels of employment than one would expect to find at the lower end of academia. While this is not itself a mark against the teaching skills of professors, be they adjuncts or otherwise, it is suggestive that when it comes to academic degree programs and institution types, you also get what you pay for. 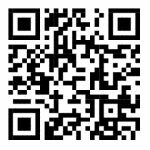 This entry was posted by Phillip W. Magness on Monday, August 24th, 2015 at 11:38 pm	and is filed under Uncategorized. You can follow any responses to this entry through the RSS 2.0 feed. Both comments and pings are currently closed.